Ever since the days of the Hudson River School, the landscape of the Rivertowns has inspired artists’ attempts to capture on canvas our unique golden Hudson River light or the classical drama of the Palisades cliffs. Walking the Old Croton Aqueduct trail today, you might still encounter latter-day plein-air painters working in that age-old visual arts tradition. But if on a recent weekend you saw a small woman atop a telescoping ladder dropping a microphone into one of the ventilators on the trail, you witnessed an entirely different form of artistic process in action. Nevertheless always ready for anything Aqueduct-related, Mavis and Elisa Zazzera agreed to open the weir chamber in Ossining to electronic music composer Paula Matthusen. “After an hour of ‘silence’ – except for our occasional whispers –with Paula crouched on the floor with her sound equipment, and computer and with Elisa taking photos, the project was not much clearer to us… but we were hooked on what might happen!” says Mavis. Matthusen, Assistant Professor of Music at Wesleyan University and the recipient of numerous awards, including a Fulbright Scholarship, is a composer of what is sometimes called “electro-acoustic” music or “sound art”, which often uses “found” or recorded sounds instead of performers on instruments as the raw material of the work. The high-quality recordings of unique sounds become the “soundmarks” – the audio equivalent of brushstrokes – of a composition. Her compositions have been described by The New Yorker’s Alex Ross as “entrancing,” and Steve Smith of The New York Times highlighted her “vivid imagination” in a review of one of her concerts. 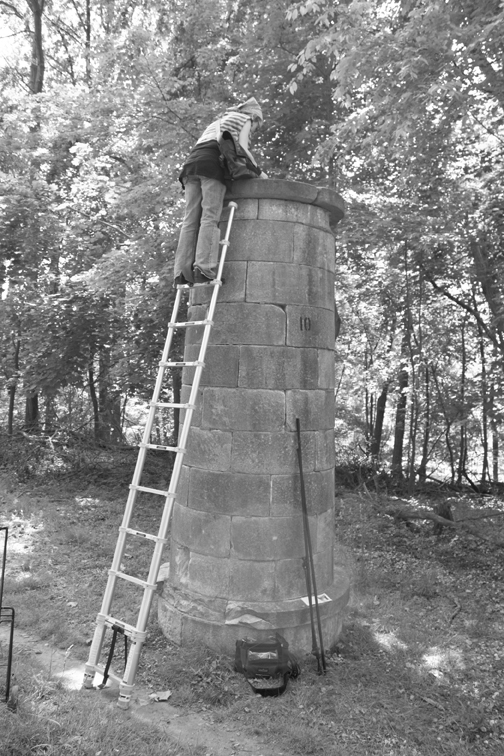 A few weeks later, Friends Vice President Robert Kornfeld took Matthusen and her assistant Néstor Prieto on a day-long tour of the trail, from the Old Croton Dam to many of the most easily-accessible ventilators. Kornfeld loves exploring the Aqueduct, “especially with people that have particular interests,” he says. “I had never thought what the acoustical personality of the aqueduct would be like. The different ventilators have a very different character acoustically, depending on their location. The dam had an incredible sound, as if the water pouring down the spillway has a resonant frequency with the whole dam. The whole thing hums. It’s just a completely different way of experiencing the system that we had never thought of.” Part of the thrill comes from the discovery of a hidden world beneath our feet.